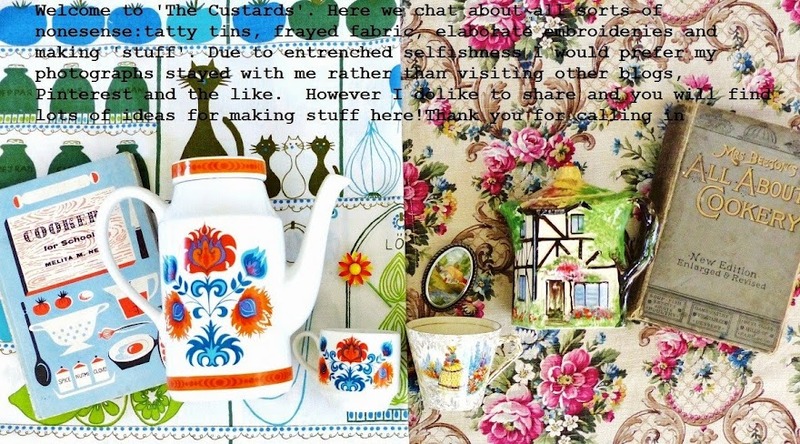 The Custards: Sewing room tales: My 'other' chair, new to me cupboard, new to me table, Spring makes and tea! Sewing room tales: My 'other' chair, new to me cupboard, new to me table, Spring makes and tea! The year is gathering pace and so is The Great British Sewing Bee - I am on the edge of my vintage seat with it all! I had divided loyalties last night as I was desperado to finish a little Milly Molly Mandy embroidery (thank you for the idea Streetcomber) for a purse (in DIRE need of a purse this week.........). I would like Chinelo to win - there I have said it. By the end of this post you might be a bit fed up of this corner! My sewing room is getting a 'bit full up'.....not necessarily with sewing-related things. Looking at this photograph every single thing, apart from the radio and daffodils, is second hand. The wicker lamp shade was a lucky find on top of the wardrobe - I must have put it there a year or so and then forgot all about it! You may recall that in a previous post I had sold a cupboard in order to make room for a cupboard.....This is my £10 cupboard - nice and chunky, solid oak and just right for putting 'stuff' in. The content of the cupboard is 'work in progress' as this is part of the previous cupboard content just 'shoved in' for now! It was all a bit of rash purchase so I had not thought this through - still for £10 I am not complaining. It is a funny old world because about a week later a different charity shop also had two very similar cupboards (slightly larger) but they were £95 each. Realised that a bag hanging behind the door 'matches' the china! Shelves are currently being constructed to go above this cupboard - we bought yet another larger cupboard in the Charity Shop Sales but 'deconstructed' it (it wasn't very nice but has nice wood) in order to make the shelving. However I am in the middle of making a Roman fort, road, temple, mosaic, lamp blind for this room - it is going to be made of barkcloth floral fabric but cannot decide if there should be a vintage embroidered border down both sides. What would you suggest? Cushion close up really - though I love making cathedral window patchwork this is a very old charity shop purchase - in fact both cushions cost a £1 each many years ago. Ah yes, my friend, we thought they'd never end.......the days when most of my purchases were in the £1 or less category. Ah, yes, now then Missus ('Channelling Frankie Howerd this morning are we? '), this would be my 'new to me' table. I am rather partial to a bit of Lloyd Loom. This was NOT a £1 - this was £25 - it was in the charity shop when I bought the cupboard but I RESISTED it at the time. When I went back to the shop to give the manager her purse the table WAS STILL THERE. CLEARLY THIS IS WAS A SIGN. Thank you kindly Martha. I will have to get rid of my old chest (steady) to really make 'proper' room for this - but table is already fully laden WITH STUFF! How did I manage without it. Here I am flicking through the latest (!) magazine. What is the message that this cover is trying to convey? Any thoughts? I am thinking that I might start a caption competition here. A very sad note here : this magazine was my very last purchase from dear Mr Langford. I have mentioned Mr Langford many, many times over the years both here and on Flickr. After a relatively short illness Mr Langford sadly died recently - we chatted on his last day in his shop. When he told me he was ill I made him a little card with 'Mary' on it to thank him and show the influence his shop had had - he was very chuffed - his shop meant a great deal to him. PPS: I was in Milton Keynes for work last weekend...and this weekend it will be Basingstoke...I live the high life I really do! I am relieved that your previous post was April Fool -I googled La Cootard to find myself referred back to your blog - car boot adventures, making adventure but none the wiser as to who but enthralled by the largesse of the personality and drama of your interview. Through all your humour you shine with kindness. Such a lovely and lively person with a humourous and great outlook on life. Thanks for entertaining so well! ~Always, always a treat to view your little corners and rooms of treasure..
LOVE the cosiness of this little sewing room! I'm popping a 'wish' in my wish box so i may have a room like this to potter and putter from day to day..
Like every one else I'm enjoying the sewing bee too.. I've even got my own Patrick ( Mr Rosey Tinted Spec's) to grow a beard, just now..haha! Take time to be, dear Jenny! Your room corner is fantastic, so much to see. Very keen on the Dolly Days china. Glad to be of help with the Milly Molly Mandy reminder. Was looking at the books again the other day and marvelling at the skill of the illustrations by Joyce Lankester Brisley. Well, Milton Keynes and Basingstoke..........for us, we were lucky to get as far as the front door......of the paper bag, of course! You definitely know how to live. Next you will be telling us that you are salting forth to Swindon.......then we shall really hate you! Now, yours is the kind of sewing corner of which we heartily approve. Lloyd Loom table, chairs replete with cushions, cheery cups and saucers, tea from china teapots and a radio permanently tuned to Radio 4. Perfect. After all, who needs threads or sewing machines or other needlework paraphernalia? Not us! As for the image on the cover of Woman's Own.........this is how one should garden......pristine pinafore covering the day dress, Marigolds to protect those perfectly polished nails and a velvet choker to add that je ne sais quoi.......just a little light tickling of the soil and then time for tea.......now, back to the sewing corner! Happy days. The Narcissi are delightful! Just love it all ... apart from poor Mr Langford, of course. I'm sure you were a ray of sunshine in his life. Secondhand gorgeousness ... love it! Thought it might be an April Fool but wasn't brave enough to stick my neck out and say so. I love your sewing room, lots to see and treasure. What a bargain that bookcase was. Very sad to read of the passing of Mr Langford, but how magical that you got to say goodbye and to thank him. Someone said to me once that people do not really leave us, they just 'go on ahead', and I'm certain he is manning a little shop up there. May I begin by sending along condolences on the loss of Mr Langford. You've written a heartfelt tribute to him. May I next tell you how much I laughed at your April 1 post. It was hilarious and very, very stylish, too. And now I thank you for this post's tour of your sewing area. Lots of sunshine and creativity there. As I survey my little apartment's clusters of creative areas, I realize that their boundaries exist only in my imagination. It's possible that I am living in my very own thrift shop surrounded by possessions acquired bit by bit since my 1960s NYC arrival into young adulthood. Jenny I love to 'see' corners of your home and your lovely treasures. I am glad you 'rescue' such lovely things and share them with us. P.s.You can never have too many cupboards. What a pretty and cheerful room. I really love the floral cups and colors you have painted your chairs and wicker table. That is a neat radio too. Love the picture on the vintage magazine. I can tell you I don't EVER wear a dress when I'm planting my flowers. Vale Mr Langford. A more fitting tribute I cannot imagine. My sewing room is also stuffed full of 'stuff and nonsense' but if it lifts your spirits it cannot be wrong I say! Now as to the magazine caption.......may I suggest this ,........"dope, what did she mean when she said I am planting dope? " I can't be the only person who's eyes were drawn to that surprisingly large biscuit tin ! It probably contains the usual bits and bobs but I like to think there's a secret supply of Jammy Dodgers stashed inside. I love your "sewing" room. I too have a house full of second-hand bits that also look second-hand and have often been told to consider having a "clear-out" (in quotes because I'm not sure what that means). I do plan very soon to make some room in the garage. Apparently there is more stuff hiding out there. Despite not knowing him, I feel quite sad about Mr Langford, which says a lot about how well you write and draw us into your world. It's also really sad to see these old shops disappear one by one. Inevitable, I suppose, and one day people will be mourning the loss of Blockbuster video or the local kebab place, I suppose. Completely agree about Cabin Pressure - brilliant! (As Arthur would say). I'll have to check out the kitchen one too. I tend to stick with Radio 4 Extra, which means I end up hearing an awful lot of Agatha Christies.